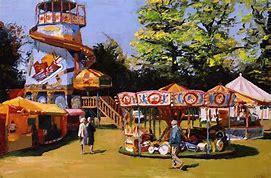 This term- we will be learning all about fairgrounds! We all know that fairground rides are designed to thrill our senses, through fear, excitement and the unexpected. How are these rides powered in a way which enables them to speed up and slow down at just the right moments, whilst staying on a track that twists upside down? These mysteries will be revealed as we learn more about the science behind energy, forces, sound and light. For our entry point this term, we had great fun creating fairground rides in forest school. In literacy, we have been learning about synonyms and antonyms. Mrs Perrin organised an 'Escape Room' challenge for us to complete. We had to use thesauruses to find synonyms and then try to piece together the clues to crack the code. This was quite a challenge! We have been learning how to write instructions. We evaluated some great instructions and some that need some work by learning how to play some different card games. This helped us to understand what we need to include in our own instructions to make them effective and easy to understand.